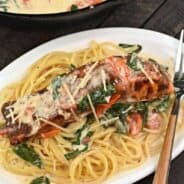 Looking for a delicious weeknight dinner idea? 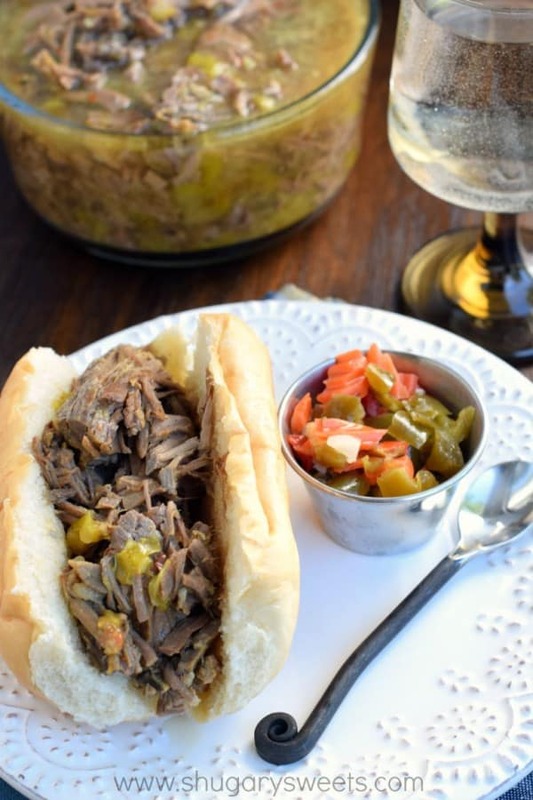 This Slow Cooker Italian Beef has very little prep work, and you can come home to a delicious meal! I love Chicago. I love the food we have here. When we moved away in 2006, I didn’t realize just how much I would miss a few of my favorite things. Pizza. You just can’t get good pizza in Ohio. No offense New York, but I love my Chicago style Deep Dish pizza. So much so, that when we lived in Ohio I had to create my own version. Hot Dogs. There is nothing like a Vienna Beef dog with a sesame seed bun. Imitations don’t even compare. 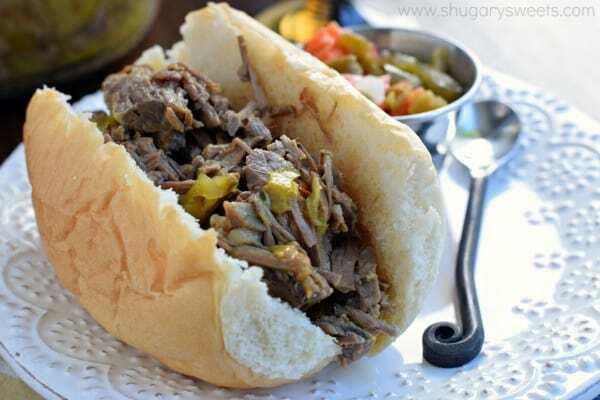 Italian Beef. 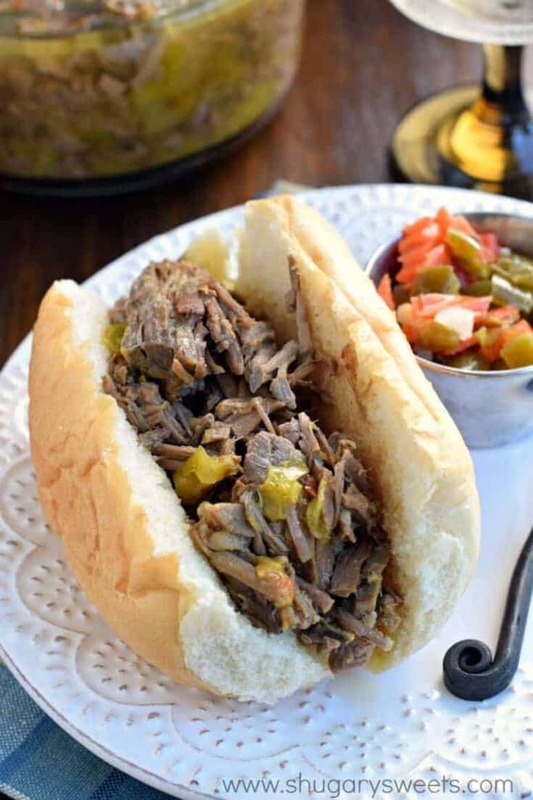 The sliced beef with spicy giardiniera on a crusty french roll is hands down one of my favorite dinners! 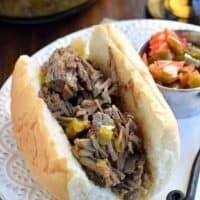 My mother in law gave us this recipe years and years ago, to make this easy Slow Cooker Chicago Style Italian Beef. to work better for me! I love the texture as they have simmered with the beef for hours in your crockpot! You can buy the spicy ones, or mild, depending on how hot you want them to be. You can also use giardiniera in the crockpot in place of the pepper rings for a milder, flavorful substitution. Well, as long as you don’t buy the spicy giardiniera that is. Now that my son is home from boot camp we’ll be having this Italian Beef for sure. And I have a great use for the beef in this recipe, should you have any leftovers!! 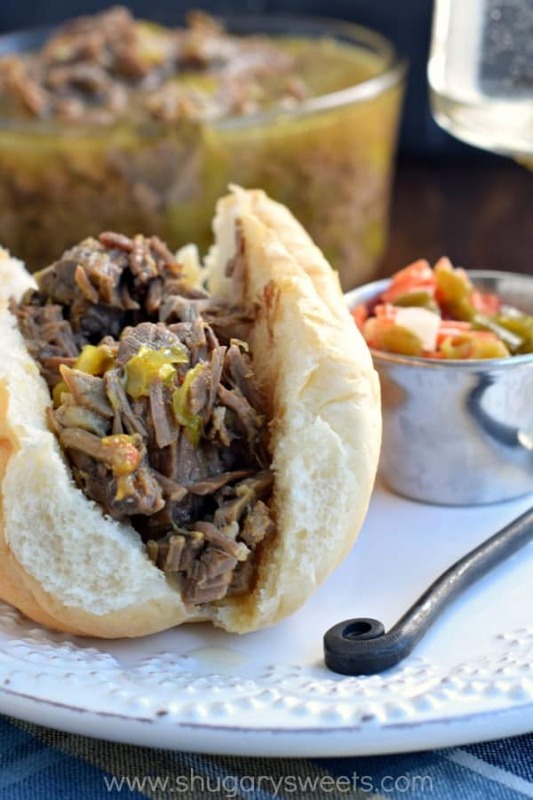 You’ll want to make this Italian Beef Ring. A little goes a long way when it comes to leftover Italian Beef! Such a simple idea for day two, yet different enough the family will love it! 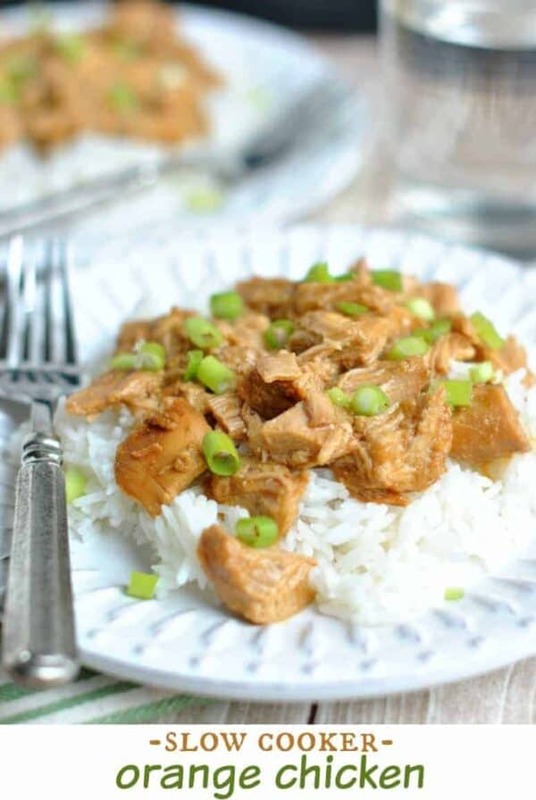 We love this easy Slow Cooker Orange Chicken recipe served on a pile of rice! 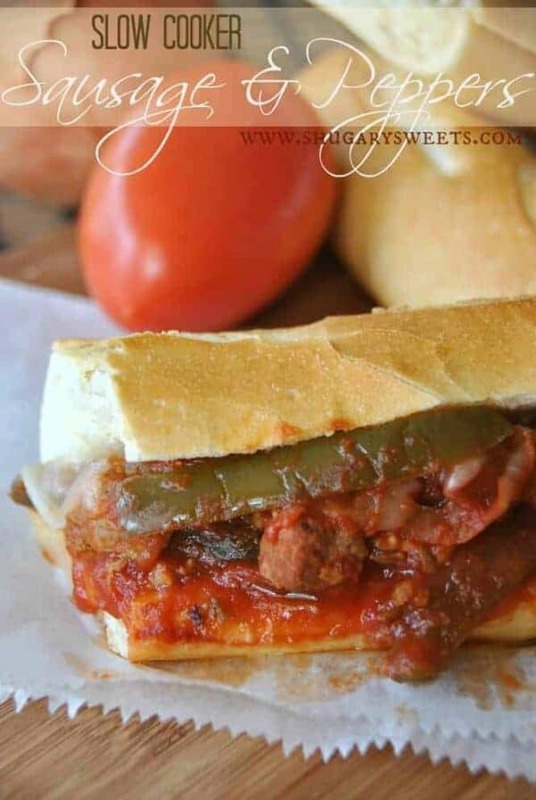 Slow Cooker Sausage and Peppers on a french roll is a great weeknight meal idea. Perfect comfort food! 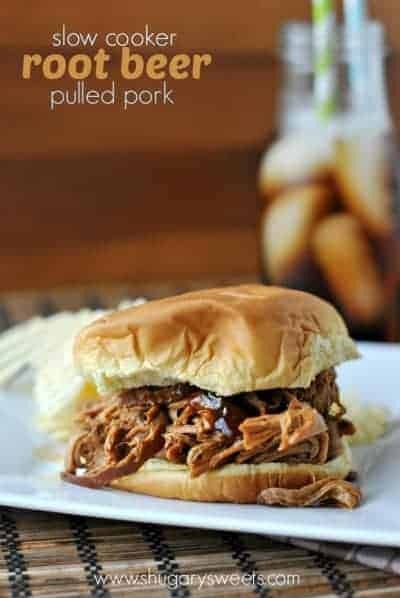 This Slow Cooker Root Beer Pulled Pork is a sweet way to enjoy your next meal. 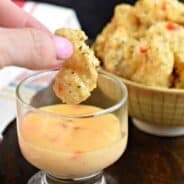 Serve with bbq sauce and enjoy! 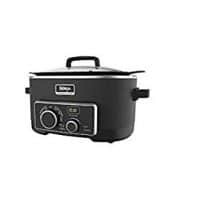 Looking for a new slow cooker? In a large slow cooker, place roast in (I like to put the side with the fat up, but you can also trim the fat if you prefer). Sprinkle the italian dressing seasoning mix over the top of the roast. Pour the whole jar of pepper rings with juice over the roast. 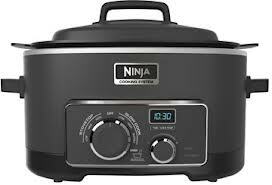 Cover crock pot and cook on low for 6-8 hours. It’s a great time for sure!! Give me some of these!!! This looks amazing! Love anything in the slow cooker and not having to deal with dinner after work! I would have been the same with with the deep dish pizza 😉 Maybe I’ll move to Chicago too! This looks soo yummy, I’m starving after seeing this picture! What a great slow cooker recipe! Definitely need to add this to our menu soon! Chicago really does have some of the best food!!!! Mmmmm now I’m totally craving some deep dish pizza…thank you for that! And slow cooker meals really are the best. Throw it in and forget about it!!! We’ve had this twice so far and I have it in the crockpot again tonight for lunch tomorrow! I personally love salty foods so it is perfect! A little bit of shredded mozzarella topped with spicy giardiniera and you’ve got yourself. Do you use a chuck roast for this recipe? AIMEE IN MY NECK OF OHIO WE TAKE OUR PIZZA VERY SERIOUSLY. OUR LOCAL PIZZA SHOP WAS VOTED BEST IN THE COUNTRY!!!! BUT I WOULDNT MIND TRYING CHICAGOS SOMEDAY. 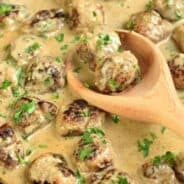 THANKS FOR THE RECIPE I WILL BE TRYING IT OUT SOON.